A car that ran a red light hit the Jewish Home MK's car. He is hospitalized but appears to be in good shape. MK Zevulun Orlev (Jewish Home) was very lightly hurt Sunday when his car was hit by another car that apparently ran a red light. The accident occurred in the neighborhood of Gilo, in Jerusalem. 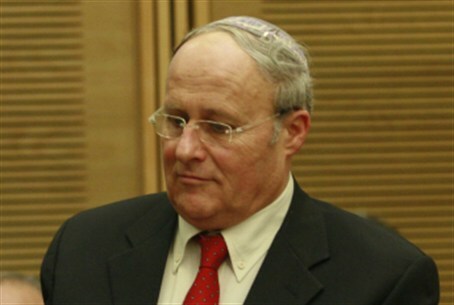 In an interview from his hospital bed, MK Orlev said: "I was returning home from the Etzion Bloc after parting ceremony for National Service volunteers in the fields of education, Zionism and Judaism, when I experienced a traffic accident as I drove my car." A car that ran a red light hit his car with great force, he said. "As a result of the accident, the air bags deployed and the car I was driving was badly damaged. I have never experienced such a forceful blow." "I was quickly evacuated to the emergency room at Sha'arei Tzedek Hospital and from initial examinations that I underwent, it appears that I miraculously emerged from the accident without immediate damage," Orlev continued. "I have been placed under supervision for several hours and I hope that I will be released in the course of the night and that I can continue my daily routine tomorrow." Orlev said that he was told that police cameras documented the other car crossing the junction in a red light and that there were numerous witnesses to the accident who said the same thing. "I thank G-d that I emerged miraculously from the accident," he said. "Anyone who sees the vehicle understands that the accident could have ended tragically."